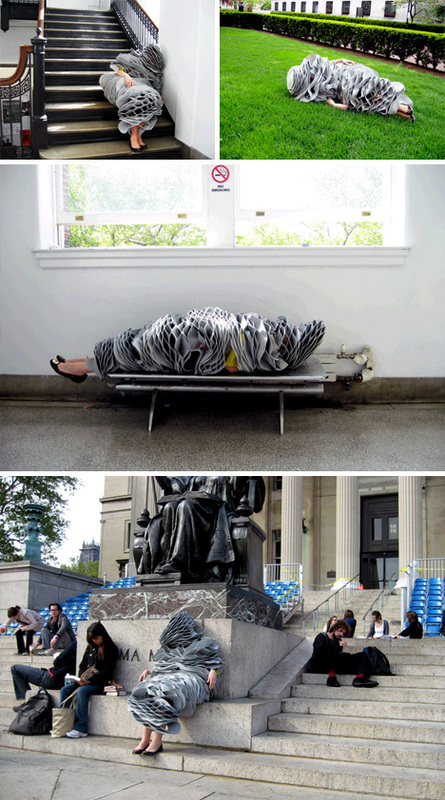 If you’re bold enough to take a nap on the grass, the steps of a public building and other unlikely places, maybe you’re bold enough to do so wearing a ‘sleep suit’ that looks like part of a costume from the set of a particularly silly children’s show. Designed by Forrest Jessee, this honeycomb suit features overlapping layers that are structurally supportive, flexible and comfortable while allowing for air flow and temperature regulation. 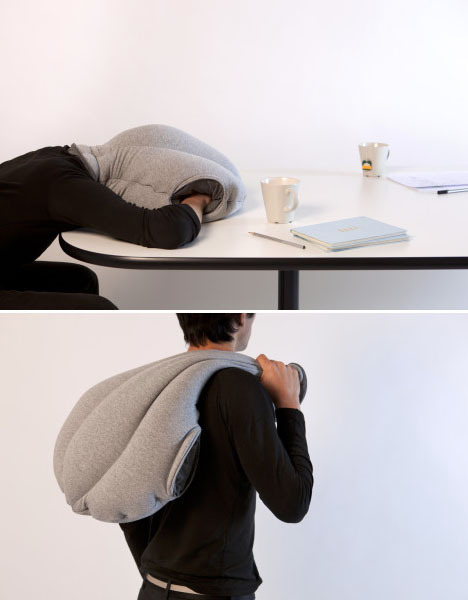 Block out the world with an ostrich-inspired nap pillow that “offers a micro environment in which to take warm and comfortable power nap at ease. It is neither a pillow nor a cusion, nor a bed, nor a garment, but a bit of each at the same time.” The head covering offers a cushion while blocking out light and noise. Perhaps you’re one of those people who will nod off on the subway, your head drooping onto a stranger’s shoulder, risking a violent confrontation in the event of errant drool. 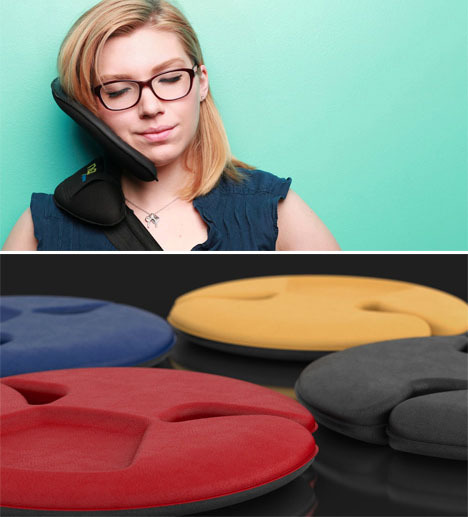 You might want to check out the ‘Nap Anywhere,’ a head support device that eliminates your reliance on unwilling human pillows. The flexible device is a flat disc when not in use, but molds to fit between your shoulder and your head when you need it. 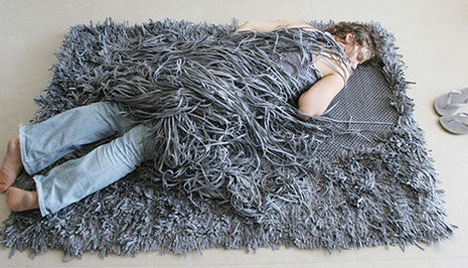 A bit more aesthetically pleasing than the hairstyle for which it’s named, the Comb Over Rug features felt strands that are long enough to wrap around you like a blanket. The Nappak is kind of like a blow-up bed made specifically for napping, providing a little bit of privacy as well as a soft and comfy sleeping surface. Inspired by cubicles, it has two walls and a ceiling, and the open side can be pushed up against the wall to block out light and prying eyes. 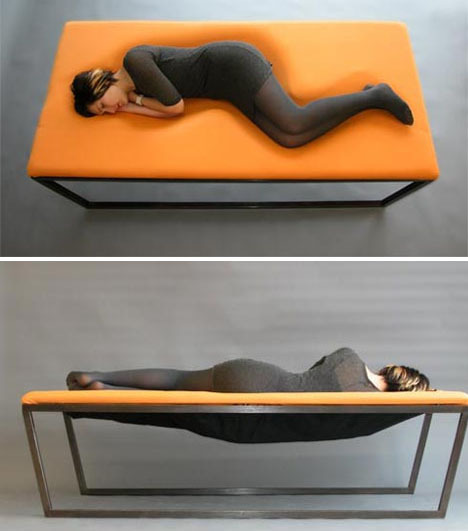 What looks at first like an ordinary bench reveals its surprise when you take a seat: the Embrace Lounge features a hidden body-shaped curve to support and envelop you when you lay down upon it.